The Lamenting Psalms (at SheLoves). | stuff antonia says. The Lamenting Psalms (at SheLoves). Oh hello! It’s been quiet here lately with school ending and moving and all that jazz, but I am hoping things will pick up a bit this summer, starting today–I’m over at SheLoves Magazine joining in on their Red Couch Book Club pick for the month–Dr. Ellen Davis’s Getting Involved With God. It’s my first time writing in that space, and I found it really fun–even though I was writing on lament. 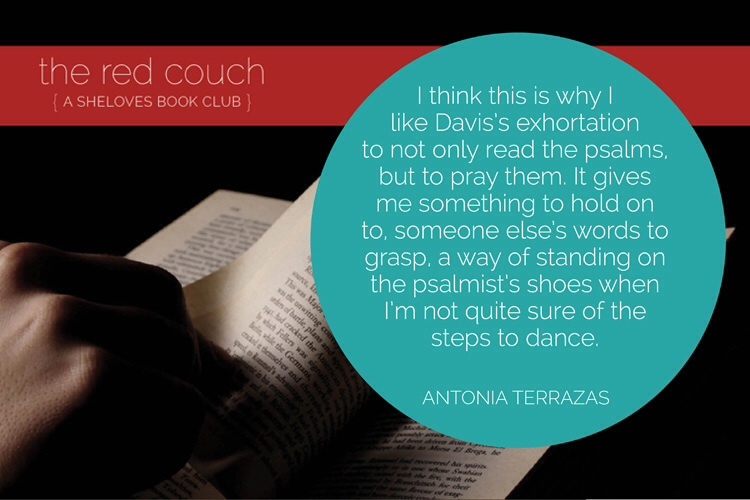 Join over at SheLoves to talk about the psalms with us? Maybe even be inspired to read Davis’s book? This entry was posted in guest posts. and tagged Sheloves. Bookmark the permalink. ← nothing hurt that couldn’t heal.